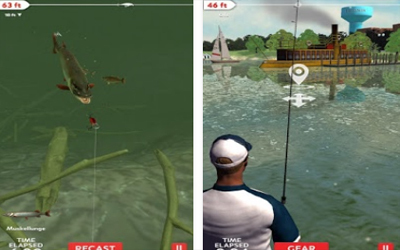 One of interesting games in fishing genre is Rapala Fishing APK 1.2. In real life, you need specific rod to catch fish on the fresh water. There are methods and baits to make fish come and hop to hook. This concept is what you find in Rapala Fishing. Player will try to catch fish from various location in North America. Before installing and playing, you should read instruction first to understand how to play this game. It might take time, but it is very useful to play conveniently. The tools for fishing are special, so knowing the instruction will be good start to accomplish the task. Moreover, the graphic is three dimensions in realistic motion for character and fish. You can see the different species of fish in this game from familiar one to the completely new. When you can catch the bigger fish, you will be placed on board to share with others. You can beat record for being the biggest catcher all the time. Use swipe to throw rod then tap it to make movement. When fish come, you will see unique behavior and prepare for tackling. Developer tries to create realistic condition because it is very essential for player. If the game is unnatural, it will lack of excitement aspect. When fish catches your bait and completely on hook, pull rod slow and fast respectively. As it mentioned above, you need to be familiar with fishing technique ranging from tool, term, and methods before playing this game. Guideline is the best start to understand this matter. The interesting part is unlimited time for fishing. You can go all day and catch many fish on bucket. Sell them to gain rewards then buy advanced rod or visiting new location. This game has been updated recently with new feature. One of them is the tips to play effectively and efficiently. This game has been downloaded millions time and keep counting. Therefore, Rapala Fishing for android is the best game to experience fishing with realistic features.